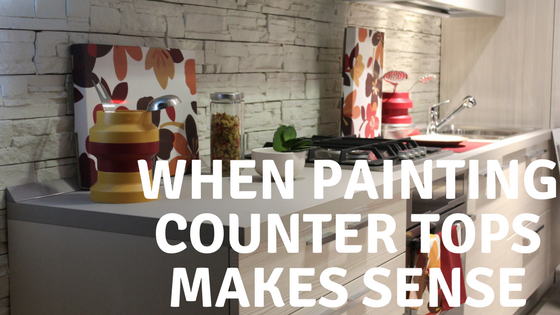 Did you know you can salvage your counter tops with paint and have an affordable way to update your kitchen? It turns out that if your current counter tops are in pretty good shape, you can paint them with your favorite color, match them to go with a new design and you can even get the expensive look of natural stone. If you don’t have thousands of dollars laying around to redo your laminate counter tops, there are a number of new, innovative and very price-friendly products that promise to do the trick. Giani offers a kit that costs about two dollars a square foot. Each kit covers 35sf. The best part of it is that you’re not limited to change if you don’t have a laminate counter top. Their product promises work on multiple types of solid surface counter tops including tile and cultured marble. It’s as easy as applying a primer, following the directions and using the recommended materials to make random patterns. Clean, Sand a second time. Okay, I’m being a little redundant, but not by much. Each kit will have its own special instructions, but you will generally start by thoroughly cleaning the entire surface including the back splash and face of the counter top. Start with a normal cleaning and make sure to remove any grease or greasy residue. If your counter top has cracks, they will need to be filled and finely sanded until smooth. Not prepping properly in the beginning will impact your results in the end. Another popular kit is offered by Rust-Oleum. Their kit differs from the others by creating a textured surface that has the look and feel of stone. It uses a heavy epoxy, instead of paint, combined with a variety of decorative colored chips. The chips adhere to the epoxy. Their kit is formulated for laminate counter tops. Both kits require thorough cleaning, sanding, application, sanding and are finished with a clear top coat to seal and protect the surface. And all three of the options use a paint roller to apply. Another very affordable option is latex paint. It’s not restricted by the contents or colors of pre-packaged kits and comes in every color imaginable. Painting your counter tops literally any color you want means you can adapt your counter tops to virtually any style of kitchen: contemporary, rustic, modern, country and French to offer a few examples. Think of the beautiful possibilities. Like the kits, the prep work is similar. You begin with cleaning and sanding the surface and cleaning the surface again. In this case successful paint adhesion requires priming and you will want an acrylic primer that specifies it will cover glossy surfaces. Then you will apply enamel paint in your no-one-else-has-it-can’t-wait-to-show-it-off favorite color. When it’s dry finish it off with a couple of applications of clear acrylic. Remember, the more shine, the more protection against wear and tear. The best thing about painting your counter tops is that you can make a mistake with the color and just do it all again. Clean, sand, clean… well, you get the idea… Prime, and try another color. Voila! It’s truly that easy. Lastly, and most importantly, if you are painting your kitchen counter top, make sure that you are using a FOOD-SAFE paint. After you have updated your counter top, it’s important to protect it for several weeks until it is completely cured. Clean it with a damp cloth… no scrubbing and never uses abrasives on a painter counter at any time. Also, always use a cutting board to protect it. It might be a really good idea to get out of your house or apartment while it cures and with all that money you just saved. This might be the perfect time for that long-overdue vacation!